New Delhi: After launching the new season with an emphatic title win at the just concluded Syed Modi International tournament, India's top shuttler Parupalli Kashyap said he needed this victory to silent the critics after been "written off". The 2012 champion, Kashyap clinched his second men's singles title at the Syed Modi Grand Prix Gold on Sunday after beating World No. 5 K Srikanth 23-21, 23-21 in a gruelling 52-minute contest and said it was a great start to the season. "It is a great way to start the season. Actually, in November itself, I thought about trying and doing well in these two events- Malaysia GPG and Syed Modi. I lost in the pre-quarters in Malaysia but luckily I could win a title in this event," Kashyap told PTI. "I am very happy to win this. I thought I needed to do well. Srikanth has been doing so well in the last year and suddenly he rose to World No. 4 and everyone was counting me off,” Kashyap said. "When I entered this event, people said I was not in form and told me that I didn't play well last year. But I told everyone that after the Commonwealth Games I actually played the best in my career. I reached the quarters, semis and quarters in the three tournaments that I played in. It's just that Srikanth had an extraordinary year and so everyone thought I was not playing well. So it was an important victory," he added. While the title gave him a lot of happiness, Kashyap ended up suffering a muscle tear in his abdomen. "My abs was injured during the match. There is a mild tear in my abdomen, I don't know how bad it is right now. There are no good physios in Hyderabad right now, so I might get it checked in Mumbai. I'm little worried about it now," he said. 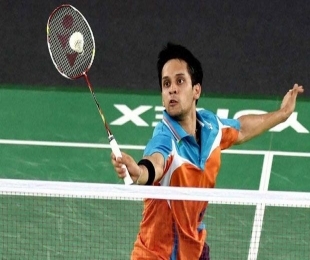 "Luckily I have time in my hand, because the next important tournament is All England, so I will have time to recover and play in All England," Kashyap concluded.